Of all the things my palate has enjoyed while in Kenya, the "chipati" has got to be one of its absolute favorites. It is essentially a fried flour tortilla, but SO much better. Ingredients include wheat flour, water, cooking fat, and salt, mixed together into a stiff dough, which is then rolled out into circles, and laid in a frying pan of hot oil. The end result is a sweet round of fatty wonder that I could eat for every meal. Then there is also Kenyan "chai," similar to what you can get at Starbucks, but with some distinct differences. If a Kenyan makes the chai, it usually contains 1/2 cup sugar per mug, and even more interestingly, camel's milk. Camel's milk is nowhere near the flavor of soy, and even quite distinct from cow's milk. It has a smokey flavor; like someone took the milk and stirred it up with a burnt log from the fireplace. That may sound funny, but the milk really does come in contact with smokey wood, as the barrels used to collect the milk are sterilized by smoking the inside. It's not a delightful flavor at first, but I've been training myself. If it were a wine, I would describe it as "earthy." My hands come in contact with blackboard chalk every day, and I most certainly dislike it. It dries out my already suffering cuticles, leaves a residue that Purell can't remove, and then goes on to make a dusty mess on everything else I touch for the rest of the day. I can't seem to write well on the board with such a small utensil anyways, and then the stick inevitably crumbles into 6 minuscule bits. Rendille skin is surprisingly soft; like worn leather, which I suppose it nearly is... In such a friendly culture, everyone shakes every one's hands, and walking around town, I'm no exception. Rendille Ingos and Mamas have hands that feel like they've been steamed over hot meals, exfoliated in desert sand, and then dipped in camel milk. The Abayas' and Abbas' hands feel like they've smoothed down by years of holding their walking sticks. And the kids; well, they just feel like they've been playing in dirt all day long. Hot water on hot days, and cold water on cold days. That's how my shower operates. Our water tank for the shower head sits on the roof of the outdoor "personal care" shack. So on scorching days, directly sunlight hits the black tank, and by 8:30 pm when I hop in to rinse the sweat off, the water is balmy, which is not, in fact, what I was hoping for. And then on cloudy or rainy days, which are admittedly few, the water is likewise brisk. Pepper, sweat, animal skins, wet-cardboard, goat dung, dust... A few of the everyday scents in Korr. My favorite, I think, is the smell of the very traditional people who live in cloth and stick huts out in the "goobs" (gobe-z) or villages. They smell like wet sand and smoke with a dash of cooking spices. I know what you're thinking: it's a little creepy to like the smell of a random person, but really, is it that much different than taking a big whiff as you walk past an Abercrombie & Fitch store in the mall? You certainly don't know those male models and probably don't shop there anymore, so the cologne scent is just as irrelevant to you as the natural smell of Rendille... And so I remain unashamed to say that these people smell good. "Robeya" means "green" in Rendille, and it is such a prevalent color here right now, that the new short-term teacher (ironically N. Irish) has been named as such. The acacia trees are vibrant, thorn bushes are leafing out nicely, and there is fluffy grass all over the ground. I'm becoming quite spoiled I think, as it is evidently never this lush in Korr. Color seems to be a theme of Sight here. 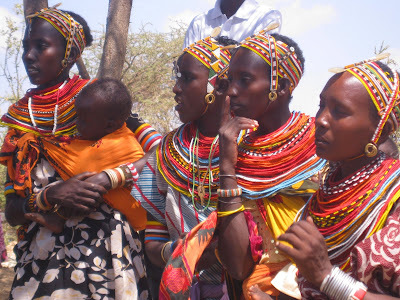 The traditional women especially make a point of wearing yards of brightly printed cotton shifts and red, yellow, black, green, and blue beads that solidly frame their necks and faces. To enhance their sparkle, the unmarried women link silver spangles onto these neck and head pieces which reflect the light and make a lovely tinkling noise as they walk by. (This is, in fact, carefully planned, as the beautiful, feminine noise is meant to attract the attention of the warriors.) As a Californian (as opposed to an East Coaster) I thought I had a handle on the vibrant colors and fun jewelry, but I don't got nothing on these girls' bling. Every morning at 5:30 am, the mosque uses its over-amplified speakers to project calls to prayer. I don't really mind it, actually, as it's so novel to live in a world where someone would even bother to broadcast a religious service across town. And not only that, but the prayers are really quite beautiful; exotic words with a slight lilting melody. There's also the near constant singing and chanting of the warriors. They're all in town right now with their camels, and it's a party! These guys are more or less on their own in the bush for long periods of time, so when everyone congregates in Korr, celebrations ensue. Along with this is the tradition of singing while they travel in large groups so as to distinguish themselves from malicious raiders. However, it is possible for this to have an equally terrifying effect, as on the occasion when they "distinguished" themselves just outside our gates in the middle of the night. To be fair, I really have not been as finicky about the bugs as my family expected. But when they buzz in my ear, hop about on the floor, and slam their obnoxious little bodies into my mosquito net at night, I get a little... testy. It's tough to sleep when you worry about some African insect biting you and sending you back to the states with a tropical disease and considerable medical bills. And so I sleep with a can of "Doom" by my bed; religiously spraying toxic amounts into my room before bed and finding comfort in that deadly "hiss" of an aerosol can. Are all those little black dots in that picture BUGS? Yikes! And I ADORE the picture of you reaching out to touch the hands of those kids. Seriously love it Claire. I would hang it on my wall. I'm really enjoying your blog! So descriptive. It's fun to learn about such a different world through your eyes. SHAN!!!! Thanks! It means so much to me that you're keeping up with my adventures! Our tasting guide would be so proud of your delicate palate. So long as Camel's milk doesn't remind you of 'gasolina'. The Rendille are absolutely beautiful, like you are :) Keep enjoying your wonderful adventure! I feel like I'm there with you! I wish I could see all the colors. Just reading about it makes me want to paint!